Differencial learning (DL) in tennis. DL is essential to INNER COACHING (TMS). Science and evidence based. This is a drill to improve the tennis forehand. The method is differencial and includes tactical variation. Right-handed player holds an object in his left hand and has to step around a mark after every hit. She is playing the ball with the forehand inside-out. Coach can set a target in the opponents field. Differencial learning means to avoid repetition, to use variations and provoke fluctuations. A constraints led drill. 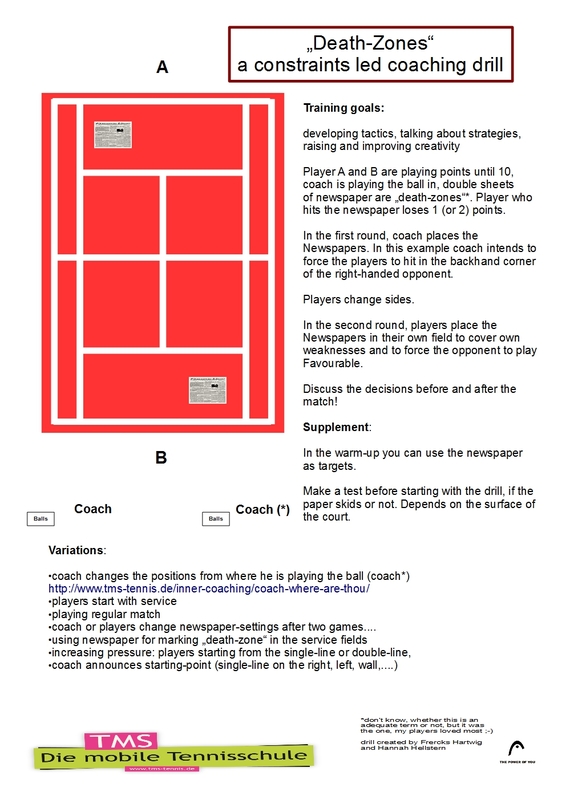 Playing around so called „death-zones“ the player has to think about changing tactics and where his or the opponents strength or weaknesses „lie“. Tim Mayottes text is about coaches and players coming out of the comfort zone and making coaching playful and „dirty“. This must – hope Tim would agree – lead to implicit coaching and nonlinear pedagogy. The summary of evidence based coaching in INNER COACHING (TMS).